Paralysis ticks (xodes holocyclus) are native to Australia and are found on the east coast from southern Victoria all the way up to northern QLD, and in the north of Tasmania. The ticks’ natural hosts are native animals, such as bandicoots, wallabies and koalas, which have developed immunity to the neurotoxin produced by the tick. Domestic animals, including dogs, cats, sheep, calves and foals, which have not developed immunity to the toxin, are affected by symptoms starting the paralysis of the back legs and progressing to paralysis of the respiratory muscles and finally the heart, resulting in death. The Australian Paralysis Tick has a 3 host life cycle. The eggs hatch into larvae, which attach to a host for a few days. The larvae feed from the host, and then drop off to transform into nymphs, which then attach to another host. After a few days the nymphs drop off and transform into adult ticks, and attach to another host. Finally the adult female will drop off her final host and lay eggs. While the Australian Paralysis Tick is found in our area of the South Burnett, we had not experienced any problems with it until we bought the property at Kumbia and introduced the herd of barford cows and calves. After only 3 weeks we noticed the first sick calf, and the second one a few weeks later. The first one recovered and the second one died. It was only after we had the vet assess the two calves that we found out that paralysis ticks were causing the illness. Having finally identified the problem, we were able to develop a plan to manage paralysis ticks on our property. We would like to use organic farming methods where possible, however, we do use chemicals when animals are in immediate danger. I should note also that the Australian paralysis tick is different to the Cattle Tick (Rhipicephalus microplus). Our properties are in Cattle Tick free areas, but this does not mean that we are free of Australian paralysis tick. Cattle tick arrived in Australia from Indonesia in the 1870s and spread to southern QLD by the 1890s. Cattle tick spreads “tick fever” and cattle ticks are a notifiable disease in Australia. Some of the methods used to control Cattle Tick do not apply to the Australian paralysis tick, but the following discussion will mention both ticks in order to explain the various control options. Apparently, in the past it was very common for cattle to be regularly forced through chemical dips. Up until the 1940s, arsenic was used to prevent cattle ticks, but the ticks developed resistance. Eventually chlorohydrocarbons, organophosphates and pyrethrenoids were found to be effective and various forms have been used in dips since the 1950s. More recently, pour-on products have been developed, these have longer persistence, so the cattle do not need to be handled as frequently. In cattle tick areas, most cattle are exposed to these chemicals on a regular basis (just saying, if you don’t buy organic meat, you don’t know if its getting dipped in toxic chemicals every couple of weeks). For paralysis tick, there is no longer a pour-on product on the market (too toxic? ), the only available products are listed in this link. Any of the suitable chemicals need to be diluted in water and sprayed or sloshed over the animal (unless a suitable dip is available, but we don't have a dip). The chemical must contact the ticks, so any ticks hiding in between toes or behind ears may be missed. We used Amitik, and poured it over both of the two sick calves that we initially identified and another skinny calf that we later found with a tick on his belly. For us, the main application of these chemicals is to get all the ticks off an animal that is already identified as being affected by ticks. This will ensure that any small ticks that are missed in an inspection will drop off the animal and prevent further toxin being injected. While a pour-on product is not available, the next best thing is an ear-tag. We used the Y-TEXPython insecticidal ear tags in all the small calves to give them some added protection from ticks until they are large enough to survive the toxin. The tags worked out at about $3/calf, and need to be cut out before the cattle are sent to sale yards, so it is not a cheap or convenient solution, but it bought us some time so that we could pursue our longer term solutions. Experiments have shown that cattle gain immunity toparalysis tick toxin and can tolerate a certain number of ticks before becoming sick. Given some more time on our property, our cows and calves will start to establish immunity to the toxin too. Pat Coleby also recommends sulphur for all biting insects. We have increased the sulphur in the minerals that we put out for the cattle. We are also going to use a product called “cattle coat” with back rubs, which the cattle self-apply. This works for buffalo fly and may help to reply ticks as well. I'm not exactly sure of the ingredients, as they are trade secret, but I believe that it contains neem and other essential oils that repel insects. It worked on Bella last year anyway. The need for humid conditions largely determines the botanical niche of Australian paralysis ticks. Low, leafy vegetation provides higher humidity levels by reducing the desiccating effects of wind and direct sunlight. This environment also suits the tick's major host, the bandicoot, as it seeks out grubs and worms in the leaf litter. Certain vegetation may be conducive to paralysis ticks. We are working to clear some of the areas of long grass, as described in a previous post, and we hope that will assist with reducing tick numbers. It is a very happy coincidence that guinea fowl like to eat ticks (see here, here and here). I say this because I have been wanting to get some guinea fowl for quite some time, and this is exactly the excuse I need. We didn’t really want them at eight acres as the property is too small to support all our chickens as well as some guinea fowl, and apparently they are quite noisy. I’ll be very happy to establish them out in the paddocks at Cheslyn Rise and just visit them occasionally. They are supposed to be good fliers and will roost in trees. The less I feed them, the more ticks they will eat. Its worth a try anyway, I have a friend that has some living wild in the bush, so they seem to acclimatise here. These are our plans anyway..... use chemicals for short term tick control while we're working on longer term solutions. Any other ideas? 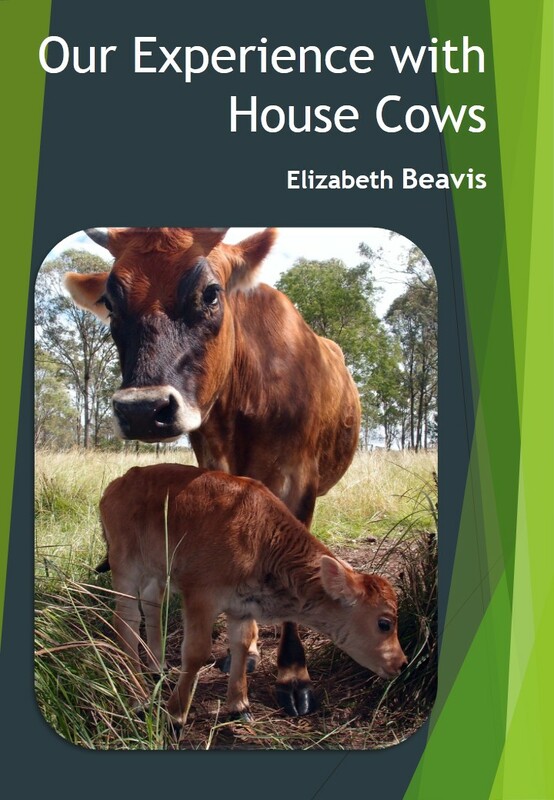 If you want to know more about house cows, my eBook is available for purchase on Scribd. Its only $4.99, and it includes lots of information about keeping a house cow in Australia. There's more details about the eBook on my house cow eBook blog. If you don't want to go through all the Scribd/paypal effort, just send me an email on eight.acres.liz at gmail.com and I can arrange to email it to you instead. Our neighbours up the rd have guinnea fowl and they do make a bit of noise but mainly when there is a threat around. They roost up in the trees at night so would be safe as long as they can fly. I am interested in the sulphur for the buffalo fly because I noticed just this morning one of our cows has some. Do you just give it as a salt lick? ticks. blergh. I remember roo ticks as a kid, on the station dogs and they looked like fat disgusting water-soaked sultanas. It's still what I see if an odd sultana is in the bottom of the wash water when the sink is drained! Good luck - I'd be keen to hear if the guinea fowl do the job. Nasty things ticks. Hi Liz, just came across your blog. Great stuff, particularly as we are about to build on 400 acres down the road from you at Somerset Dam. I love posts as it is exactly the same thing we are planning on doing with our farm. We already have 40 odd head of droughtmaster on there and unfortunately we have to battle both the cattle and paralysis ticks. I hate using those pour ons, there is only one winner in that equation, and it's not the cattle or consumers. It will be interesting to hear how your progressing after tick season gets going again. Hi Liz, we have only a small number of sheep and a couple of alpacas. Rather than buy chemicals suitable to do 100's of animals, our local produce store owner suggested dog tick collars. Apparently during a particularly bad season, a local cattle farmer bought heaps of them to use on his calves and it was really successful. Of course they aren't weather proof which is a draw back but on the sheep and alpacas they get hidden in the fleece so perhaps that protects the collars during short showers. Who knows! But so far we haven't had a problem since using them. Obviously this wouldn't be ideal if you had huge numbers of livestock to treat and probably only suitable for light weight animals. Around here though apparently the ticks won't affect full grown cattle unless its already ill with something else. you need like a thousand of those guineas! zoikes! actually they do a great job.... and aside from being loud i really like them. our main concern was that our guineas were annoying our neighbors. but i dont think you have that same concern. are keets or adult guineas hard to find there?